This is a message broker that supports version 3.1 and 3.1.1 of the MQTT protocol. MQTT provides a method of carrying out messaging using a publish/subscribe model. It is lightweight, both in terms of bandwidth usage and ease of implementation. This makes it particularly useful at the edge of the network where a sensor or other simple device may be implemented using an arduino for example. 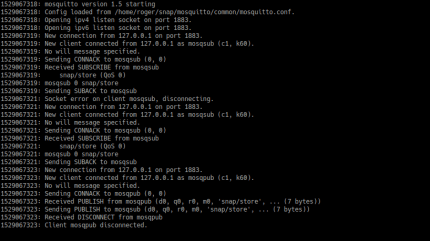 By default mosquitto will be installed as a system service, using the default configuration at /var/snap/mosquitto/common/default_config.conf. If this does not meet your needs, create the file /var/snap/mosquitto/common/mosquitto.conf and this will be used instead. 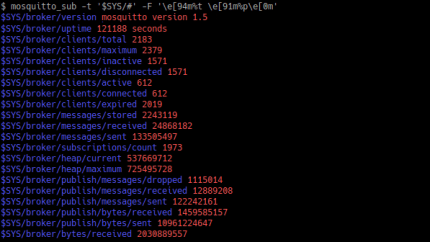 Note that only files inside /var/snap/mosquitto/common can be read by mosquitto, you cannot put other configuration files in /etc/mosquitto.